(VOVWORLD) - Prime Minister Nguyen Xuan Phuc stressed the need to develop an e-Government Thursday while chairing the initial session of the National e-Government Committee. Mr. Phuc said Vietnam has been planning to develop an e-Government for a long time, and information technology applications have been implemented at all levels to familiarise people with the e-environment. So far, Vietnam’s e-Government ranks no higher than 68th of 93 nations worldwide and 6th of 10 in ASEAN. PM Phuc said the Committee’s other members are ministers of relevant ministries and leaders of four major IT companies in Vietnam. The participation of the Prime Minister and the Deputy Prime Minister reflects a strong political determination to build an e-Government. 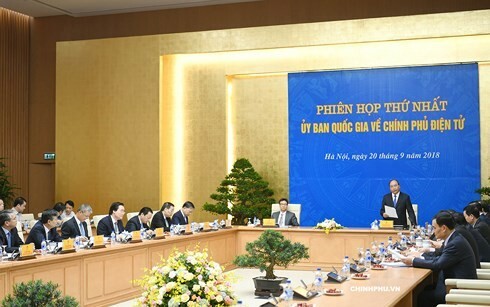 On the occasion, the PM witnessed the signing of cooperation agreements on e-government building between the Government Office, the Australian Department of Foreign Affairs and Trade, and the World Bank in Vietnam, along with regulations for coordination between the Government Office, the MoIC and the Government Information Security Commission.